Heat oil in a large saucepan or frying pan and sauté onion, garlic and mince until lightly browned. Add tomatoes, stock powder, sweet chilli, herbs and paste and simmer for 15-20 minutes until it forms a sauce consistency – thicken with combined corn flour and water if the beef is quite liquid, simmering for a further 2-3 minutes. Whisk together the sour cream, mayonnaise and eggs. 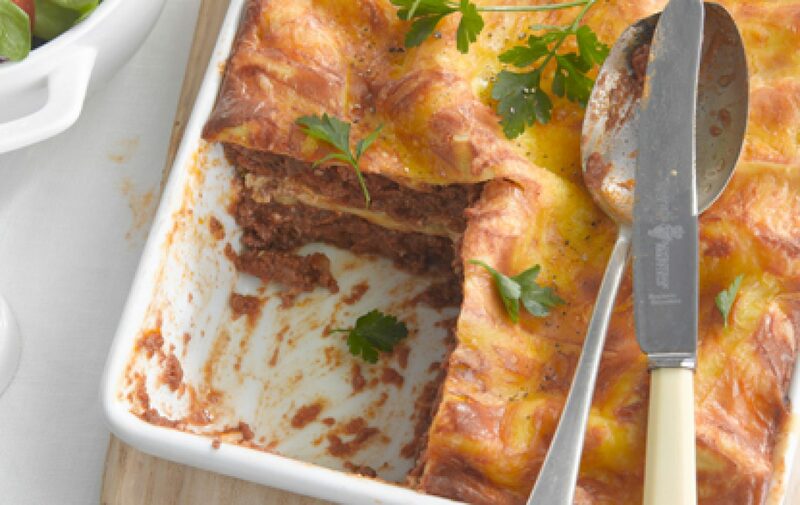 Arrange half the beef in the base of the lasagna dish then top with a layer of lasagna sheets. Cover with half the mayonnaise mixture and repeat the layers, finishing with the mayonnaise mixture. Sprinkle over the cheese and bake for 40-45 minutes until golden and the pasta sheets are tender.